For growing businesses, a single office location is often not enough. As organizations increase in business and capital, they typically expand and set up multiple offices across different geographical locations. While these new offices can be great for increasing business, they can also bring additional communication challenges. In the past, communication for multiple offices would require companies to invest in and installing detailed company infrastructures, like servers and databases, at each of their new locations. These solutions, while technically effective, take a significant toll in terms of time, effort, and money. Thankfully, we now have a better. Modern communication and collaboration technology, like solutions available from MangoApps, allow offices to easily share content and work together despite geographical differences. Our newest article takes a look at the 4 of the most powerful ways companies can use MangoApps’ innovative Office Locations feature. 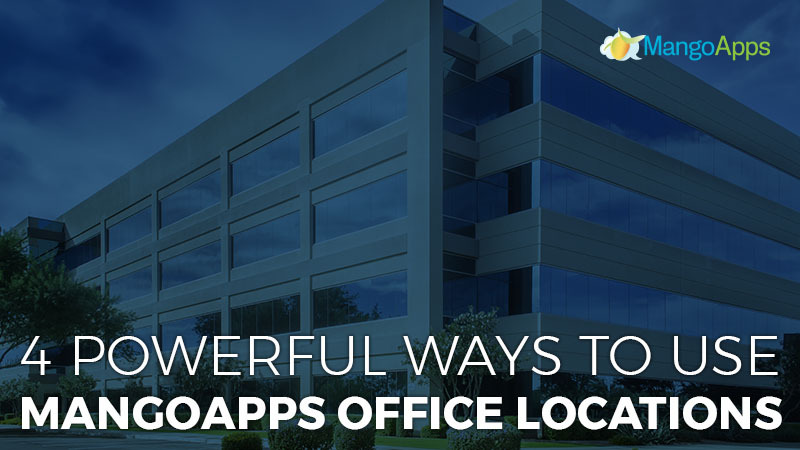 MangoApps Office Locations that give users detailed, organized, and simplified location-based information. This provides employees with one central place to easily access all company office location information. 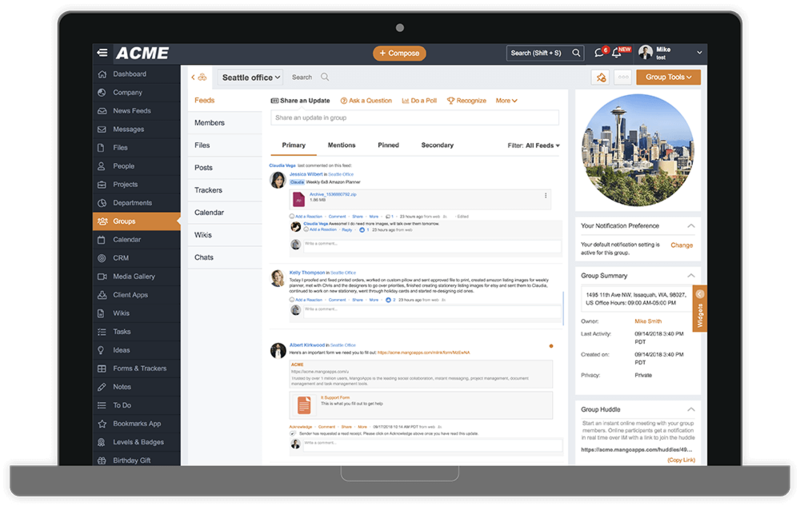 This detailed office locations content can include everything from basic information like local time, office address, and office hours, to detailed and specific content like company holidays and emergency contacts. Employees can easily browse offices by location or use advanced search filters. Each employee can access integrated maps, local time, company holidays, and other location and facility details in one easily searchable section. This helps increase employee awareness of other branches and makes it much easier for employees to collaborate, coordinate, and communicate with coworkers in other regions, countries, and time zones. With MangoApps Office Locations, employees are automatically added to groups based on the selected office location in their employee profile. These auto-created local groups give employees a space to communicate and share information relevant to their location. Location-specific groups offer all of the features available in traditional MangoApps groups like calendars, updates, questions, and much more. Unlike other groups though, location-based groups are built around the goal of improving local employee engagement, communication, and company culture. With a dedicated space specifically designated to meet local needs, employees can share news, updates, and ideas openly, and get to know each other better, all without creating irrelevant content for other offices. 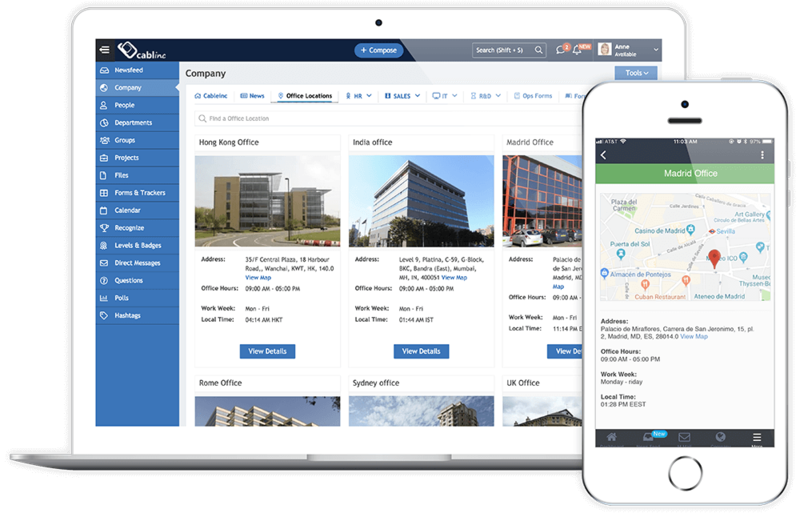 MangoApps Office Locations and Employee Directory work together, allowing you and your HR department to search for employees by department, location, expertise, skills, and more. You can also look for people matching multiple search criteria and even save advanced search filters for later use. Employees can even use the predictive type-ahead search bar to go directly to a profile page or quickly find a specific user. 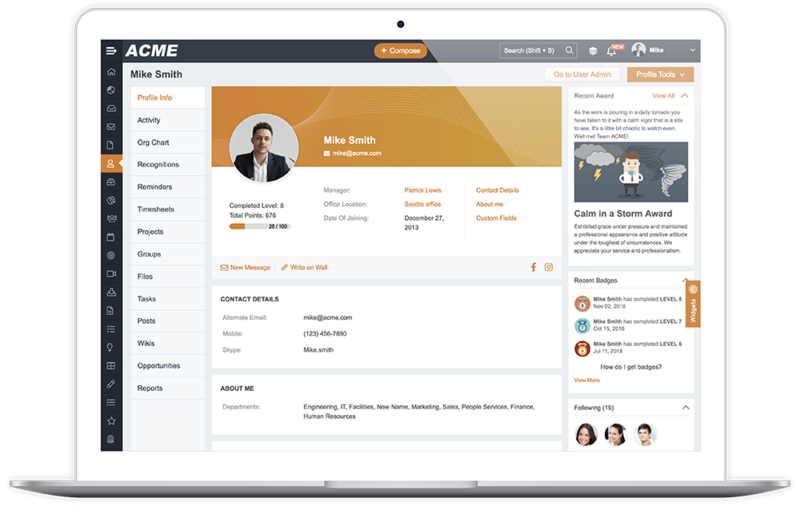 Office Locations and Employee Directory make hiring from within easy, as you access employee’s talents, skills, work history, and achievements. Hiring from within also encourages other employees to take advantage of career opportunities and progress within the organization, boosting work ethic and improving overall productivity. When an organization invests in a new branch, it’s important for the new addition to be able to communicate effectively with existing branches and quickly establish a successful work culture. MangoApps Office Locations help management successfully implement any necessary changes and quickly become a thriving part of the company organization. With Office Locations, not only is the branch in sync with the latest organization-wide news and events, but it is also able to enhance and boost its individual employee performance. 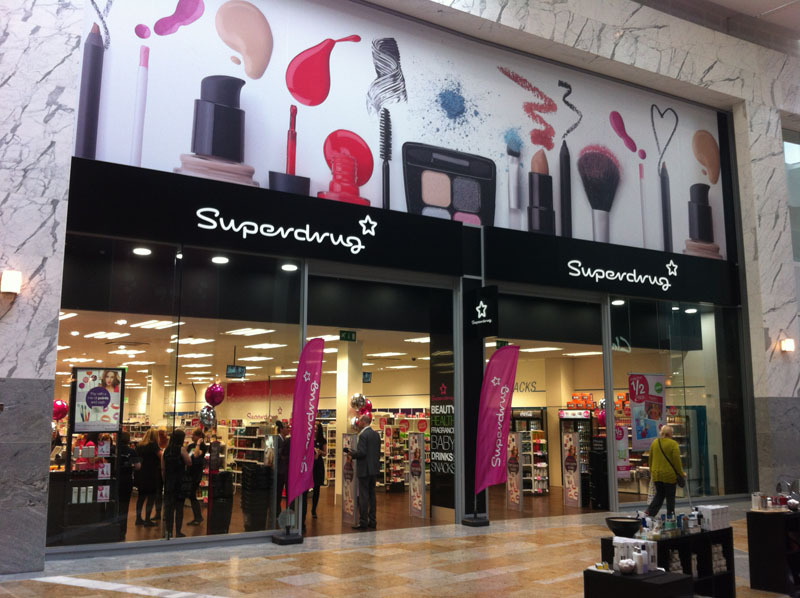 Office Location can easily implement any new instructions from the Head Office, ensuring that there is uniform and effective company-wide communication. More importantly, though, office location groups help employees in that location celebrate their successes, feel engaged, and improve their company contribution. MangoApps Office Locations provide companies and organizations with the freedom to expand and adapt to their growing needs. With detailed and up-to-date office information, specific office groups, and the interconnectivity MangoApps provides, every employee and every branch can find success on both a local and company-wide level. To learn more about office locations or how MangoApps helps companies orchestrate growth and development, contact us or schedule a personalized demo today.